On May 23, we celebrate our favorite sweet and chewy treat on National Taffy Day. 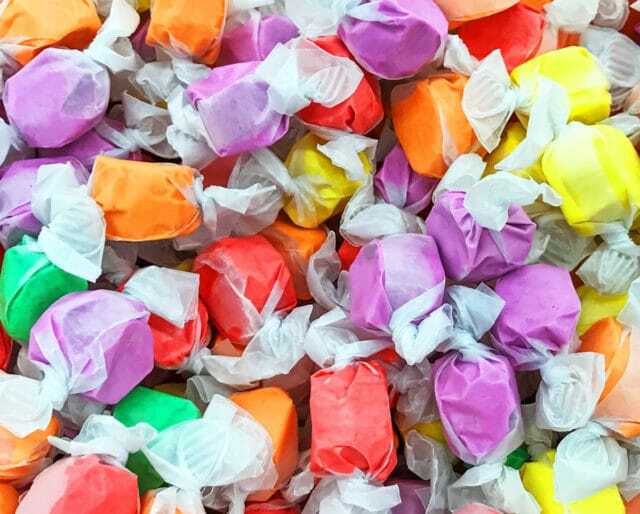 Taffy has a long history as one of America’s native sweets. Common lore has it that in the 1880s, a Jersey Shore candy shop got flooded, soaking the shop’s taffy stock with Atlantic salt water. On a lark, the owner sold the candy as “saltwater taffy” and an American delicacy was born! Today it’s sold on boardwalks up and down the Eastern seaboard of the U.S. and has even found its way to landlocked candyshops. National Taffy Day is a day to indulge in the sweet pastime of unwrapping that twisty wax paper and popping a chewy bit of taffy into your mouth. Yum! Watching taffy being made is not to be missed! Most taffy factories offer guided tours so that you can see how taffy is heated in huge copper kettles, and then slowly cooled by hand on cold marble slabs and then put on a machine that now does the pulling. Gorging on candy for National Taffy Day might not seem like the best advice, but then again it is the custom for other holidays (not naming any names)… so having a few taffies is a great way to celebrate! Not only is taffy a delicious candy, enjoyed by all ages, but making it is also a real upper body workout! Nowadays taffy is made by machines, but in the past, or if you are making it at home, you use the ‘taffy pull’ to add air to the taffy mixture. This is what gives taffy its distinctive texture. We love that tasting taffy takes most Americans back to childhood memories of blissful summers by the sea. As taffy is traditionally sold at boardwalks, it has been a staple of American seaside resort towns for over one hundred years. Taffy has survived the test of time because of its unique texture, which comes in almost every flavor imaginable; from vanilla, maple, mint and watermelon, to raspberry, banana and licorice… or anything else you can think of!